Tall and erect chickpea cultivar HC 5 (Haryana Chana 5) was primarily bred for inter-cropping with autumn planted sugarcane. Cultivar HC 5 is distinctly different in morphology from traditional bushy or semi-spreading chickpea cultivars and it is found suitable for machine harvesting. However, a general recommended planting density (30 cm × 10 cm) is being followed for cv. HC 5 as well. In this study, we hypothesized that high-density planting can improve crop productivity and also improve the plant architecture for mechanical harvesting. To test this hypothesis, four plant spacing treatments (30 cm × 10 cm, 30 cm × 7.5 cm, 22.5 cm × 10 cm, and 22.5 cm × 7.5 cm) were evaluated in two chickpea cultivars (HC 5 and JAKI 9218) for crop growth, grain yield and the desirable plant traits for mechanical harvesting. The highest grain yield of cv. HC 5 was observed with 22.5 cm × 10 cm spacing that increased the grain yield by 9% (p < 0.05) over plant spacing of 30 cm × 10 cm (conventional); this indicates that high-density planting could increase the productivity of the cv. HC 5. Where grain yield of cv. JAKI 9218 was reduced (p < 0.05) with the increase in planting density over 30 cm × 10 cm. Increased grain yield of cv. HC 5 with 22.5 cm × 10 cm spacing over 30 cm × 10 cm was mainly attributed to increase in plant density (33%); however, all the plant attributes (primary branch, secondary branch, pod plant−1) were reduced as compared to plant spacing of 30 cm × 10 cm. The decrease in intra-row spacing of cv. HC 5 resulted in a strong adverse effect on plant growth and yield parameters as compared to inter-row spacing and thus not recommended. High-density planting increased the plant height (erectness) and ground clearance of cv. HC 5 (height of first pod) (~ 30 cm), an essential prerequisite for mechanical harvesting, but not in cv. JAKI 9218. Hence, cv. HC 5 requires a dense planting for higher yield and appropriate plant structure for mechanical harvesting. Therefore, it is recommended to work out the optimum planting geometry/plant population to realize the potential yield of cultivars bred for mechanical harvesting. 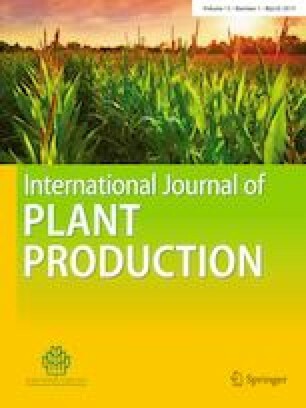 The authors acknowledge the financial support received from Department of Agricultural Cooperation & Farmers Welfare, Ministry of Agriculture and Farmers Welfare, Government of India under the National Food Security Mission project ‘Developing chickpea cultivars suited to mechanical harvesting and tolerant to herbicides’. DES, (2018). Directorate of Economics & Statistics, Department of Agriculture, Farmers Welfare and Cooperation, Ministry of Agriculture and Farmers Welfare, Government of India. https://eands.dacnet.nic.in/APY_96_To_06.htm. Accessed Aug 2018. ICRISAT, (2017). First machine harvestable chickpea variety-Boon for farmers in Andhra Pradesh, India. Retrieved November 12, 2017, http://www.icrisat.org/first–machine–harvestable–chickpea–variety–boon–for–farmers–in–andhra–pradesh–india.